This Praxis Speech-Language Pathology study guide includes Praxis Speech-Language Pathology practice test questions. Our Praxis Speech-Language Pathology study guide contains easy-to-read essential summaries that highlight the key areas of the Praxis Speech-Language Pathology test. Mometrix's Praxis Speech-Language Pathology test study guide reviews the most important components of the Praxis Speech-Language Pathology exam. The Praxis Speech-Language Pathology Exam is extremely challenging, and thorough test preparation is essential for success. 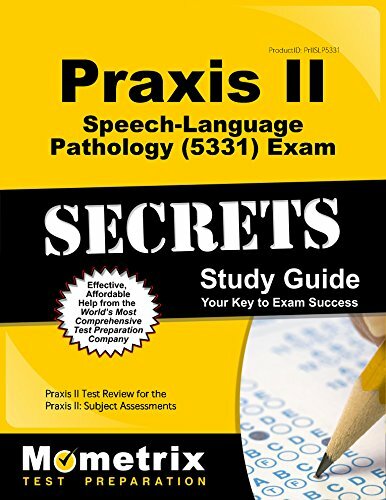 Praxis II Speech-Language Pathology (5331) Exam Secrets Study Guide is the ideal prep solution for anyone who wants to pass the Praxis Speech-Language Pathology Exam. Not only does it provide a comprehensive guide to the Praxis Speech-Language Pathology Exam as a whole, it also provides practice test questions as well as detailed explanations of each answer. It's filled with the critical information you'll need in order to do well on the test: the concepts, procedures, principles, and vocabulary that the Educational Testing Service (ETS) expects you to have mastered before sitting for the exam. These sections are full of specific and detailed information that will be key to passing the Praxis Speech-Language Pathology Exam. Concepts and principles aren't simply named or described in passing, but are explained in detail. The guide is laid out in a logical and organized fashion so that one section naturally flows from the one preceding it. Because it's written with an eye for both technical accuracy and accessibility, you will not have to worry about getting lost in dense academic language. Any test prep guide is only as good as its practice questions and answers, and that's another area where our guide stands out. Our test designers have provided scores of test questions that will prepare you for what to expect on the actual Praxis Speech-Language Pathology Exam. Each answer is explained in depth, in order to make the principles and reasoning behind it crystal clear. We've helped thousands of people pass standardized tests and achieve their education and career goals. We've done this by setting high standards for our test preparation guides, and our Praxis II Speech-Language Pathology (5331) Exam Secrets Study Guide is no exception. It's an excellent investment in your future. Praxis Speech-Language Pathology test prep book that provides a comprehensive review for the Praxis SLP test. Praxis Speech-Language Pathology exam prep that will help you elevate your Praxis SLP test score. Praxis Speech-Language Pathology review book that will help you avoid the pitfalls of Praxis SLP test anxiety.